“I was delighted and optimistic when the care staff at the Minnesota Zoo asked if I would help administer Botox to ‘Haps’ the shark to help improve his condition of scoliosis.” Said Dr. Crutchfield. 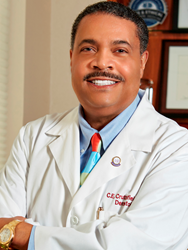 Charles E. Crutchfield III, M.D. is a graduate of the Mayo Clinic Medical School and a Clinical Professor of Dermatology at the University of Minnesota Medical School. He currently is the Medical Director of Crutchfield Dermatology in Eagan, (serving the greater Minneapolis-St. Paul area), Minnesota. Dr. Crutchfield is an annual selection of the “Top Doctors” issue of Mpls. St. Paul magazine and the “Top Doctors for Women” issues of Minnesota Monthly Magazine. Dr. Crutchfield is the co-author of a children’s book on sun protection and dermatology textbook. He is a member of the AΩA National Medical Honor Society, an expert consultant for WebMD and CNN, and a recipient of the Karis Humanitarian Award from the Mayo Clinic School of Medicine. Dr. Crutchfield was also given “first a physician” award, Healthcare Hero, 100 most influential, and one of the Top 100 African –American Newsmakers in the United States by TheGrio, an affiliate of NBC News. https://en.wikipedia.org/wiki/Grio_Awards.